Nothing is nicer than catching up with old friends especially when we only see them every three or four years. 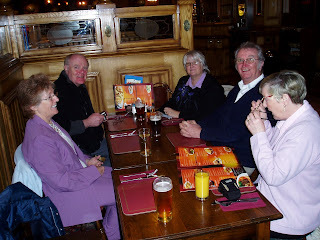 This particular evening we went to a pub for a meal and a quiz night which was a lot of fun. Marlene on the left is married to Ron in the centre right while Vic at the back on the left is married to Rosalie on the front right and that's me at the back in the black jumper. These are special friends who are always there when we land in England. Ron and Marlene have been to Australia to visit us once but we are still working on Vic and Rosalie.